Consumers looking for Thunderbolt-compatible external storage that can keep up with a rough-and-tumble lifestyle now have a new high capacity option, as Seagate's LaCie subsidiary unveiled an updated version of its Rugged Thunderbolt range that ships with 1 terabyte of solid-state storage. According to LaCie, the new drive increases storage space —up from 500 gigabytes —without a corresponding bump in size or weight. Transfer speeds can reach 387 megabytes per second, meaning that users could move 100 gigabytes of data in fewer than five minutes. The drives ship with both Thunderbolt and USB 3.0 connectivity, and do not require an external power source. LaCie gives the Rugged Thunderbolt an IP 54 dust and water resistance rating, and the device is capable of surviving drops of up to 2 meters. LaCie's iconic orange-and-silver design is likely familiar even to Apple fans who do not make use of external storage, as they are used in most Apple Store Genius Bars. 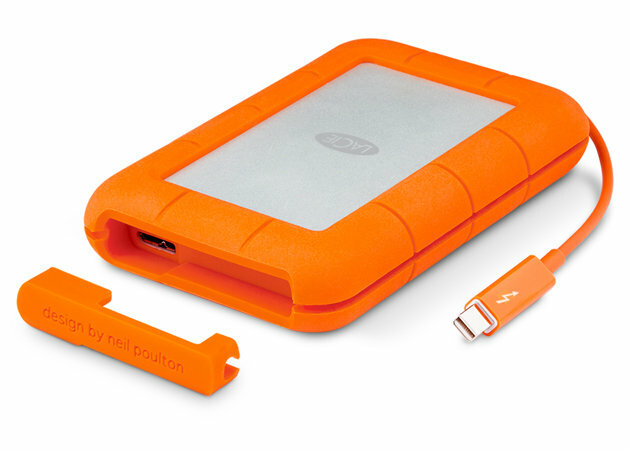 "Wherever digital content is created and wherever our customers want to travel to capture and collect it, our LaCie Rugged Thunderbolt drive will go as the ideal companion," LaCie executive Erwan Girard said in a release. "With fast Thunderbolt speeds that save hours in the field and now a 1 TB SSD capacity, our customers can focus on the creative process instead of worrying about transfer times or storage limits." The new drive will be available later this month for a suggested retail price of $949.99.